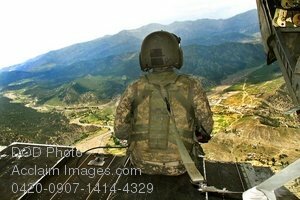 Description: Free, public domain image: National Guard Soldier Sitting on the Ramp of a CH-47 Chinook Helicopter in Flight. U.S. Army Spc. Benji McHugh of Bravo Company, 2nd Battalion, 238th Aviation Regiment, Michigan National Guard watches for other aircraft from the ramp of a CH-47 Chinook helicopter in Sharano, Afghanistan,June 19, 2009. (U.S. Army photo by Sgt. Prentice C. Martin-Bowen.